Here is our student testimony for the month. I have the privilege of getting to work with Caroline, Catherine's sister at Collin College. It is always so neat to see how FOCUS is a part of so many families lives in many different ways. Read her testimony below! It is so hard to wrap my head around being in the last month of my apprenticeship. Each month feels like a year in some ways, or as if no time has passed at all. This time of year I tend to get pretty emotional, and pensive because of all the changes that happen, and it's very hard for me to embrace. However, instead of being a big baby, I am choosing to lean into the discomfort of life change and say a big fat thank you. Thank you to my prayer and financial support team. Without your provision, and belief in campus ministry, our big staff of 25 people wouldn't be able to be full time campus missionaries. I am reminded of Paul's letters and how he always starts off with prayer and thanksgiving for the different churches he is writing to. Just know that I am so thankful for your belief in campus ministry, and for supporting my vision in campus ministry. It has been a joy to form new relationships, rekindle old ones, and to have a deeper appreciation of what I get to do. Thank you, thank you, thank you. Meet Elizabeth and Scott. My second set of parents who also support me in ministry. They have had my back since the 7th grade. I love them so much. Secondly, I want to say thank you to our goofball students at Preston Ridge and Spring Creek. They truly made ministry so fun, inviting. and really care about other people. They showed up, worked hard, and didn't complain. Our students understood the impact Jesus was having in their lives, and they weren't afraid to bestow that to other people. I also want to say thank you to Hannah and Raven. I got to lead a women's small group at Preston Ridge this past year. I honestly don't know where the ministry would be without Raven. She believes in that places, and has faithfully stayed there for the students of that campus. From Hannah and Raven I learned more deeply about humility, strength, and what it means to really depend on God. 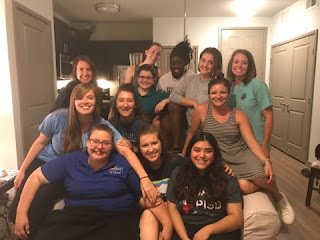 Please pray for our students that are transferring to other universities, that they would seek for where God is working and they may join him there. Lastly, I just want to say thank you to our staff. It has been a joy and a privilege to serve with these guys and girls. This has been one of the hardest years of my life in terms of being stretched mentally and spiritually. It was honor to serve a campus with these dinguses by my side. - pray for our staff and students who are flying up to Washington this week! We will learn about campus ministry in depth. Pray for stirred hearts, safety, and spiritual growth! - please join me in prayer as I continue to fund raise for a second year on this staff! I am currently 40% fund raised. If you know anyone who might be interested in supporting my vision in campus ministry, please send them my way! Hey Shayla! I love the pictures. I think Collin staff has the best looking team of all the FOCUS staffers. ;) I am so pumped you're staying on for another year, and I love the grace and humility you show in all you do. Love you!